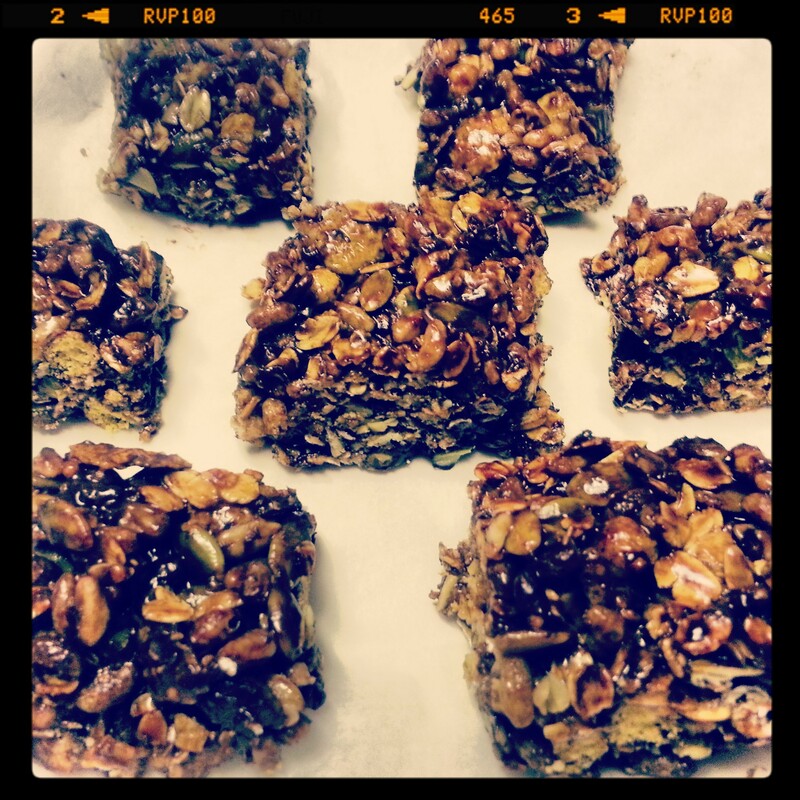 Here are my rice krispie square and granola bar inspired “Chocolate Crunchy Squares or Bars”. They are sweet, chewy, gooey and of course crunchy! Two nights ago I was suddenly craving for rice krispie square, a fond memory of a yummy treat from my childhood, and at the same time, I wanted granola bar as a snack for my day trip the next day. It is quite strange yet I guess it’s a natural response, as I slowly move towards healthy eating, I no longer feel the compulsion to buy a snack outside (e.g. from vending machine, fast food etc.) to satiate my hunger. I rather bring my own healthy snack to munch on or wait till I go home to make something nutritious. As a result, I decided to combine my desires for both a rice krispie square and a granola bar into creating the following healthy snack recipe. -You can substitute any cereal into the recipe and it doesn’t have to be gluten-free. I made it gluten-free to suit my dietary needs. -If you have a sweet tooth, this recipe is most definitely for you! The squares/bars are extremely sweet. If you don’t want them that sweet, you can decrease the amount of honey into 2/3 cup, and the chocolate chips into 1/4 cup. -Please store no more than 2 days at room temperature in airtight container, covered with parchment paper. Warm up honey on medium heat until it simmers in a saucepan. Immediately add cereal and rolled oats in the saucepan, and stir evenly. Quickly add sunflower seeds and pumpkin seeds and mix well. Reheat mixture in saucepan on medium heat, and quickly stir in the chocolate chips until well coated. The chocolate chips should melt within seconds. Remove from heat and press mixture evenly into a baking tray (lined with parchment paper). Cool mixture completely before cutting into either squares or bars. I am now experimenting with gluten-free alternatives in my baking and eating. It’s an area that I’m unfamiliar with, but excited to learn more! As a chocoholic, I had to add a bit of chocolate into my naturopathic doctor’s recipe, so below you will find my version, with some minor changes. Have fun baking it! Preheat oven to 350°F. Line muffin pans with large baking cups. Combine almond flour, baking soda, salt and cinnamon in a bowl. Combine raspberries, vanilla, manuka honey and eggs in another bowl. Fill each baking cup evenly with the batter. 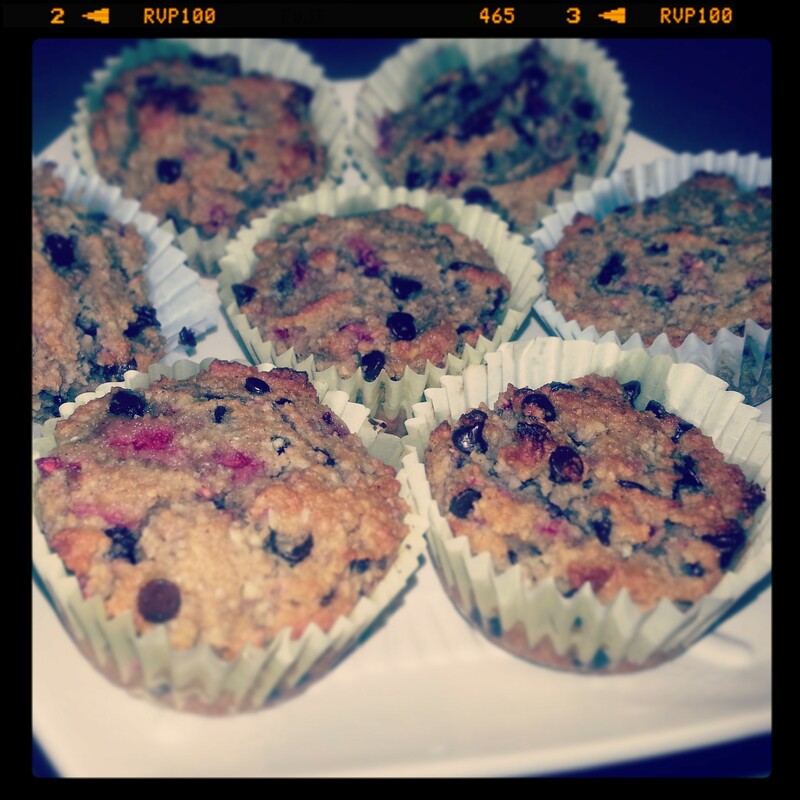 Let the muffins cool completely. Craving for Chocolate Chip Cookies! Even though I’m a chocoholic at heart and have a sweet tooth, I have cut down on my sugar intake greatly (through eating chocolates and baked goods) in the past 6 months. After I began seeing my naturopathic doctor, I am now more aware of the importance of eating right, and how it is connected to my overall health and wellness. Healthy eating is truly a reflection on how you feel. In the past 6 months, at the advice of my naturopathic doctor, I have reduced sugar and dairy from my diet, and increased my fruit and vegetable consumption. I also tried my best to cut down on eating processed food. The wondrous discovery from eating healthier is that I find my energy level has increased and I no longer feel bloated or sluggish anymore! However, about 2 months ago, I had this craving for my favourite chocolate chip cookies. I knew clearly that I shouldn’t buy them from a package as I used to, since it’s processed food, and the thought of eating homemade chocolate chip cookies made from butter and white/brown sugar seemed unappetizing. Suddenly, I was inspired to google and see if there was such a thing as a healthy homemade chocolate chip cookie out there! To my joy, I found this website (see below), and realized that I can eat my chocolate chip cookie without feeling yucky. After experimenting with and baking a successful batch of cookies, using healthier ingredient substitutions, I learned that “balance” is the key to sweetness in life, even when it pertains to baking and eating! Below you will find my version of healthy chocolate chip cookies, inspired by http://www.eatingwell.com/healthy_cooking/healthy_cooking_101_basics_techniques/kitchen_tips_techniques/how_to_make_chocolate_chip_cookies_healthier. It is a very big hit with my health-conscious family! Special Note: This version tastes less sweet than the classic chocolate chip cookie, but still tastes delicious with a nutty flavour, and is a healthy source of fiber, protein, omega-3, and calcium! Preheat oven to 350°F. Line 2 baking trays with parchment paper. Mix oats, whole-wheat flour, cinnamon, baking soda and salt in a medium bowl. Blend tahini and peanut butter in a large bowl with a wooden spoon. Add manuka honey, and continue mixing until well combined. Beat in egg, then egg white, and then vanilla. Stir in the oat mixture until just moistened. Finally, stir in chocolate chips and walnuts. With damp hands, roll 1 tablespoon of the batter into a ball, place it on the baking sheet and flatten it to about 1/2 inch thick; don’t let the sides crack. Continue until batter is gone, spacing the flattened balls 2 inches apart. Bake the cookies for about 15 minutes or until golden brown. Let the cookies cool completely or if you can’t resist the freshly baked cookies while it’s still warm, wait about 10-15 minutes to eat it. Bon appétit!! What is your version of the healthy Chocolate Chip Cookie? I would love to hear from you and try out your recipe!